VPN services are great tools that help you bypass China’s internet censorship to access Facebook, Google and other blocked web services in China. However, VPNs do cost money and you may be unwilling to spend your hard earned money without trying out the service in advance. I lived in Beijing, capital of China and have tested more than 15 VPN services in China. Below are my reviews of the VPNs that work well in China which offer free trial before purchasing it. 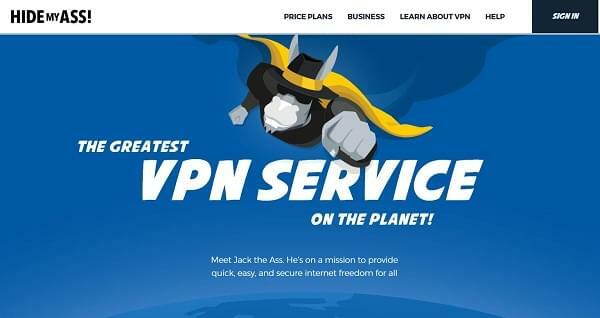 Besides free trial, some VPN services also offer money-back guarantees – you can see these services by clicking the following links. VyprVPN is one of the best and most secure VPNs that works well in China. It can help users bypass the Great Firewall and enable users to access Facebook, Youtube, Google, Twitter and other blocked services in China. VyprVPN has its own dedicated network of servers in 70+ countries worldwide. 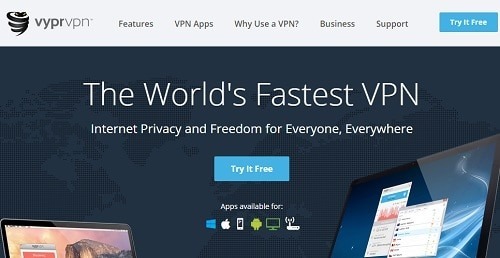 Its VPN software is easy to use and support platforms of Windows Android, iOS and even Linux. One account allows 3 connections on two devices at one time for basic plan and up to 5 devices for premium plan. VyprVPN offers unlimited data transfer and there are no download caps or server switching fees. • 7 day free trial. • Some servers not working in China. NordVPN is a VERY secure VPN service located in Panama. They protect your privacy and do not keep any logs at all. Nord also uses “double encryption” tech to protect you from being tracked. Its performance is usually good in China, but it may be slow on certain servers, you need to change to the servers located near China to obtain the best speed. I tested Youtube in Beijing, China. Speed is pretty good. NordVPN supports different platforms including Windows, Linux, Android and iOS. It provides servers in 62 countries worldwide. It even allows up to 6 devices to connect VPN at one time, this is very cool. Its price is also competitive, starting from $2.99/month for a 3 year plan, $3.99/month for a 2 year plan, $6.99/month for a 1 year plan and $11.95/month for 1 month plan. Their live chat support is very efficient. If there is problem for setting up and connection, you can contact their live chat support, very fast and very professional reply. You can get your problem fixed up very quick. In China you should switch to TCP protocol under Setting, the UDP protocol not working. NordVPN offers a free 7-day trial (you will be charged a small amount to verify your payment provider, Your 7 days of free trial account will be active immediately after the successful verification). And besides it also has a 100% 30-day money back guarantee policy. • Support Windows PC, Mac, iPhone/iPad, Android & Linux. • A little pricey compared with others. HideMyAss(HMA) is a long-standing UK-based VPN provider. It provides a 7 days free trial. Users will enjoy 30 days free trial followed by a subscription for 12 months on a continuing basis. Users will not be charged during the 7 day free trial period. If you do not feel good with HideMyAss, you can cancel your account during the 7 day trial period without being charged. If you feels good and want to continue to use it, you will be charged $83.88 for the initial 12 months subscription. HMA has a huge server network with servers in more than 190 countries, almost every country imaginable in the world. Our latest test proves that it has quite impressive speed. Its monthly price is $11.99/month, however if you subscribe for 12 months, the price will be $6.99/month, 42% cheaper than one month subscription. HMA has a poor reputation largely due to its history of handing the logs it keeps over to the authorities. However, If you do not care much about it, you can try their service. We do not offer a free trial in China. Astrill service works well in China unlike any other VPN providers who often have problems there. If you stay outside of China, you should still can get the free trial by contacting their support staff. • Apps for phones, tablets, computers, TVs, gaming consoles or routers. • Accept payment via PayPal, Credit Card, Wechat Pay, AliPay and Bitcoin. Astrill VPN is an excellent and secure VPN service that works well for users in China. Astrill’s VPN servers are located in 49 countries all over the world. It allows users to use “encrypted'” and essentially anonymous connections to protect privacy and security. Astrill offers unlimited bandwidth and a generous 7-days free trial for new users (not available for users in China now). You can ask for a free trial by contacting their support staff. What I like most is that they do not ask for any payment info from new users. With a free trail account you can try it out and make sure if their VPN software works well on your computer or mobile devices. Astrill permits up to 5 devices to be connected at one time. Though they stops free trial in China, it’s still a fantastic service among all VPNs that I have tested in China. We strongly recommend using a VPN service that supports a free trial in China. I believe that most VPN services work well outside in China, but inside China where many web services and even VPN services are disturbed, you had better have a free test before purchasing. 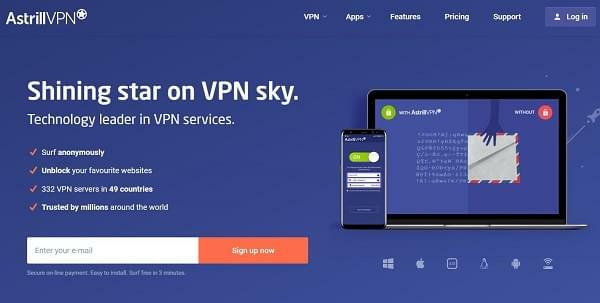 The VPNs listed above work well in China and they offer great free trials, you can try each VPN service before you make up your mind. Astrill has stopped provide free trial for users in China. But it really works in China. At present, I am using it in China.